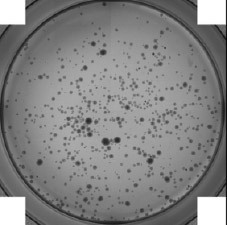 The Celigo imaging cytometer has been developed to fully automate imaging and analysis of tumorspheres. This automated morphometric analysis tool significantly reduces the time and effort needed to quantify key aspects of 3D spheres including size, growth, growth tracking over time, and response to chemotherapeutics. A gate was set to show the software identification of embryoid bodies sizes. In this example, the red EBs have an average area of 11,577 square microns compared to the green embryoid bodies that have an average area of 38,196 square microns. Also, this distribution shows that most embryoid bodies fall within 10 – 50k square microns with very few very large embryoid bodies that are 100k or more. Whole well images from a 6-well plate were acquired and analyzed. Below are representative raw and analyzed images of the forming embryoid bodies. 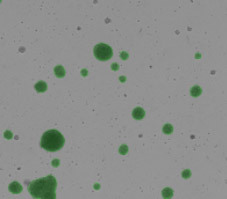 Green outline indicates counted stem cell aggregates. PDO’s generated from 6000 mouse pancreatic cells seeded in Matrigel® and imaged 3-day post seeding. 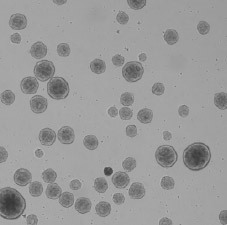 Whole well bright field images were acquired and organoid sizes automatically determined by Celigo software. Green fill pseudo-color is used to easily identify Celigo counted PDOs. PDO’s generated from 2000 mouse pancreatic cells seeded in Matrigel® and imaged 3-day post seeding. 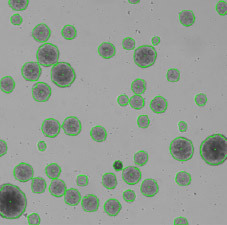 Whole well bright field images were acquired and organoid sizes automatically determined by Celigo software. The inset shows a zoomed in bright field image. Celigo software was used to generate the whole well RFP and bright field overlay image. PDO’s generated from 500 mouse pancreatic cells seeded in Matrigel® and imaged 3-day post seeding.